Do you want to learn more about Seasons? 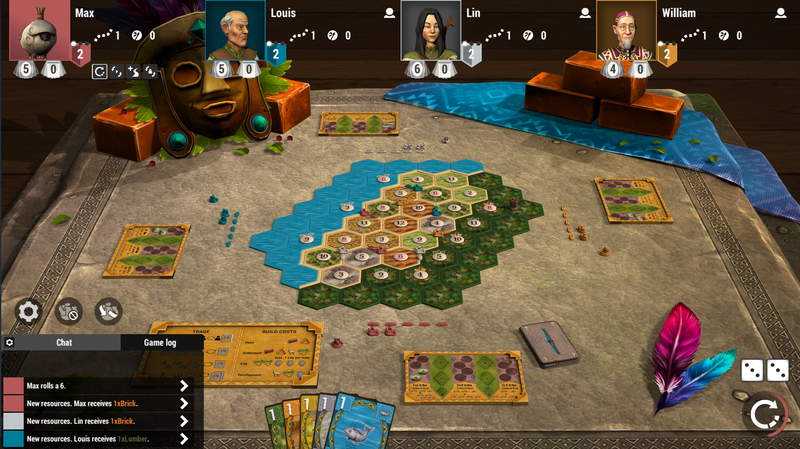 Play this brand new Catan standalone edition for the first time ever as a digital adaptation. Lead your tribe through 3 eras and experience a whole new dynamic gameplay as your older tribes will eventually be swallowed whole by the jungle or your ambitious opponents. "Rise of the Inkas" is for Catan veterans and beginners alike. It is true to the basic Catan rules but offers entirely new gameplay mechanics and challenges. 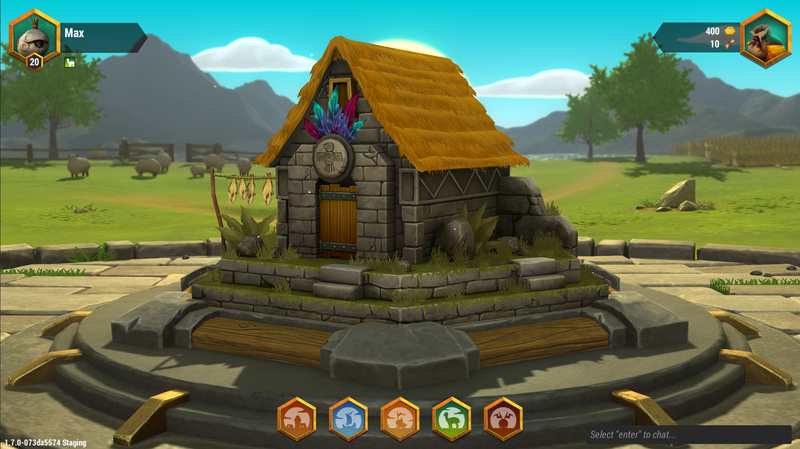 Catan “Rise of the Inka” will be available for 500 Gold in the Catan Universe Store. To celebrate the biggest consumer boardgame fair in Essen (Germany) we will offer all our Catanians great deals on expansions and customizations during the fair. Save 20% and more on selected items. Make sure to log in and check out our daily new offers for the Catan boardgame and the Avatar Sets. Our discounts will start on Thursday, Oct. 25th at 9 am [CEST] until Sunday. Please note: If you already own an item that is going to be discounted. You won’t see the discount in the in-game shop. We are aware of the issue that the AI is not agreeing to trades that it has offered before, and the fact that it's then continuously throwing better offers at you without accepting them either. This turned out to be a more intricate problem than we initially thought since it's not just a functionality bug, but instead, the AI is "consciously" deciding to not trade with other players sometimes. This is because of a general AI system that is being used to identify the players that the AI is currently directly competing with, e.g. because a player and the AI both have the same building option nearby or because of the current VP situation. However, this system is independent of trade offers, because trades can also be accepted by other players that the AI is currently not directly competing with. Therefore the AI sometimes makes and increases trade offers, that it then does not accept itself, because the only player that accepted the offers is a player the AI does not want to trade with due to of the current in-game situation. So we are currently writing, implementing and testing a new system that will streamline the way the AI evaluates offering trades while taking into account its relation regarding other player’s positions. Unfortunately, this does take time but we wanted to let you know that we are of course still working on this until it is sustainably fixed. Due to the great feedback for our first Catan Season, we are very excited to announce a series of competitive Seasons called "Catan - The Emperor’s Quest"! So starting this December we are looking for the most skilled Catan players Catan Universe has to offer! 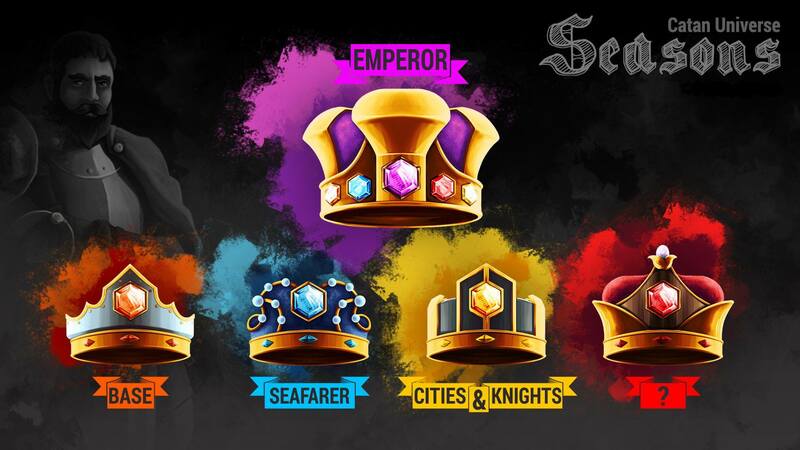 In order to win the prestigious Emperor’s Crown, you’ll have to show that you're an extremely versatile Catan player that is able to master all the Catan variants we have and finish every Season in the top 1% to win every Crown necessary to earn the ultimate Crown of the Emperor! Of course, we will make it worth your while, as every Season is going to have great rewards even if you're not able to finish at the very top. We will start on December 17th with another Base Game Season to make sure everyone has a chance to participate but we will follow it up with the first Seafarer Season in spring 2019. Stay tuned for more information on the upcoming Season soon! Take a first look at our exclusive orient game set. You will be able to win the Orient game pieces, orient table and orient resource-set, including newly designed tiles for Catan Universe in the upcoming Season. 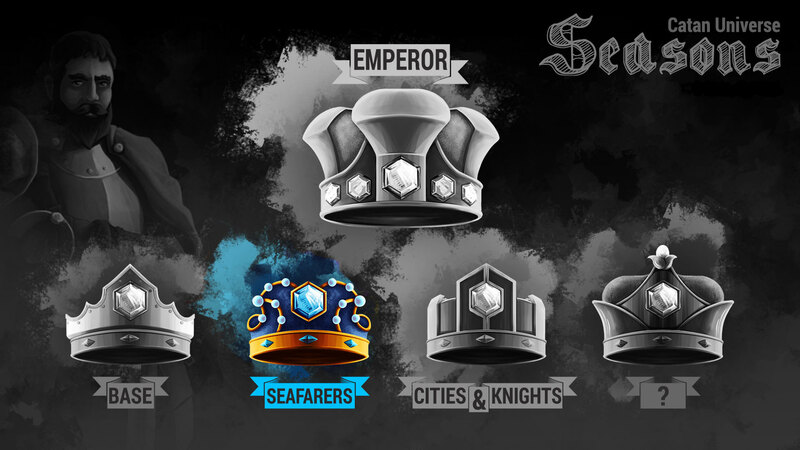 Our top players will additionally receive a crown for their mastery in the Basegame. You can already check out the Orient set in your player profile today. Season 2 will start on Dec 17th, 2018. 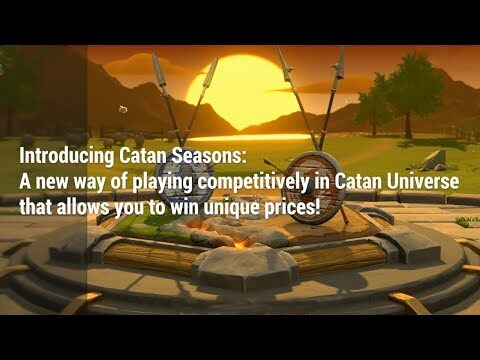 Catan Universe will provide an official Discord server for you to join, meet fellow Catanians, talk about Catan and search for likeminded players to play with. Like here in the forums and any other channel provided by us adhering to our Code of Conduct [Link] is a must and users that don't follow those rules will be removed from the service accordingly. As stated before: This is an experiment. If this proves to be a useful tool for members of the community to connect to each other we are planning to offer the Discord server over a long period of time. Why are we using the Discord service? It´s easy to pick up and it´s free to use! Today, February 11th [CEST] at 11 am, our servers will go into maintenance mode for a few hours. During that timeframe, we'll release Catan Universe 1.7.2.
we are currently working full speed to resolve the issue on older iOS devices with only 1 Gb of ram that causes the App to close. We do our best to provide an update next week. Thank you very much for your patience and feedback on this very specific issue. Our official Discord servers offer now custom game voice chat channels. These channels are for small groups of players that want to talk to each other during a Custom-Match. We want to give our iOS users a quick update on the progress in regards to fixing the issue on iOs devices with 1 GB of RAM. In the course of the last week, we made good progress in fixing the issue. Unfortunately, we are not able to release an update yet. The reason for the App closing (on its own) on older iOS devices is that the shared memory on these devices isn´t large enough. Therefore the App gets closed by the operating system. We are currently reworking some of our systems and how they allocate memory. As you can imagine we have to be very careful during this process since making changes to these systems can cause unwanted side effects very easily. We want to thank our community for giving us vital feedback on this issue, helping us identify it. We will let you know once we are confident when we will be able to release a stable patch. Today April 1st at around Noon [CEST] we will start rolling out Update 1.7.3 for iOS, Android, Steam( including OSX Version) and the WebGL. The Amazon will follow in the next days. This update includes a complete rework of how Catan Universe uses your systems RAM as well as a new and improved login process for accepting or declining our ToS and Privacy Policies. Especially Catanians using a system with little RAM available will profit from the changes and they will have a more reliable experience overall. The App now runs more stable on devices featuring a very limited amount of RAM. This includes older iOS devices like the iPad Air 1, iPad 4, iPhone 5s, 6, 6s and so on. We are excited to announce the next official Season in Catan Universe which for the first time will be played out in the Seafarers expansion! The Season is going to start on the 12th of April at 01:00 pm (CEST) and will last until the 28th of April at 11:59 pm (CEST)! This time participating in the Season will cost 5 Scrolls and of course, this will also be the second entrance in "The Emperor's Quest" which requires you to collect all four Season crowns in order to obtain the prestigious "Emperors Crown"! Stay tuned for more information on the available prizes! Have fun and see you on the island!